The International Court of Justice (ICJ), ruled on Thursday that it has jurisdiction to continue hearing a dispute between Bolivia and Chile. Bolivia lost 400km (240 miles) of coast to Chile in a 19th-Century war and has been landlocked ever since. In 2013, Bolivia asked the ICJ to order Chile to negotiate Bolivia's claim to be given access to the Pacific. 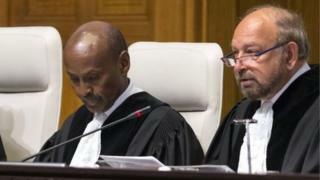 Chile argued that the case did not fall under the jurisdiction of the ICJ, but the ICJ judges dismissed that argument. Bolivian President Evo Morales said it was "a day Bolivians would never forget". The two countries have had limited diplomatic relations since 1978, and previous attempts to negotiate the redrawing of the border have failed. Thursday's ruling means the case can now continue to be heard by the court in The Hague, a process which could take many months, if not years. Chilean President Michelle Bachelet was quick to point out that "Bolivia hasn't won anything". "This ruling does not affect the territorial integrity of Chile," she said. Chile argues that a 1904 peace treaty between the two countries settled their border. But Bolivia says high-ranking Chilean officials promised on at least six occasions over the ensuing decades that they would sit down with their Bolivian counterparts to negotiate Bolivia's access to the Pacific. Bolivia stresses that it does not want the ICJ to rule for or against its claim to the 400km-stretch of coast but that it only wants Chile to agree to negotiations, with the outcome to be decided by the two neighbours "by peaceful means". Eduardo Rodriguez, who is representing Bolivia's case before the ICJ, said he was very pleased with Thursday's ruling, which he called "an initial victory" for Bolivia.